circa 1885 The 65-room Iron Springs Hotel in Manitou Springs, Colorado was the first in the region to have electric lights when its own water-powered turbine became operational in 1885. 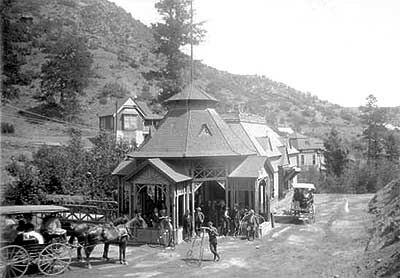 The town grew up around the gold mines in the Pikes Peak area, 60 miles south of Denver, in the late 1850s. When the gold strikes began to play out, travel through Manitou Springs dwindled. But interest in the town's ancient mineral springs increased as tourism boomed at one of the West's first destination resort communities. Presidents Grant, McKinley and Theodore Roosevelt were famous visitors; so were circus showman P.T. Barnum, inventor Thomas Edison, actress Lilly Langtree and many others. In 1884, the LAW began promoting bicycle tourism with discounts for cyclists at rural inns that participated in LAW advertising programs. Country roadhouses that lost business as railroads replaced stagecoaches catered to weekend bicycle tourists and the new business of recreational tourism filled the economic void. In Colorado, William Blackmore, an English investor and friend of developer William Bell, suggested that the name "Manitou" had a much more romantic ring to it than Villa La Font, the name given by early French trappers. 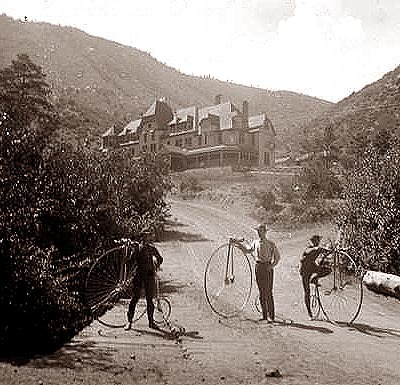 The name was changed and the first hotel, the Manitou House, was opened by August of 1872. The Ute Iron Spring Chateau, circa 1887. Exterior view of the Ute Iron Spring Chateau, looking east. This one story frame structure was a popular destination for hundreds of tourists every summer day in Manitou Springs, Colorado. In the foreground, the octagonal pavilion with its latticework and projecting bays has numerous excursionists around it. Its faceted conical roof with ornamental dormer, vent-cap top and flagpole provides shade for more people inside. On Ruxton Avenue, horsedrawn surreys and men with Homborg hats and high-wheeler bicycles loiter in the sun. The bridge across Ruxton Creek and power lines are in the left, and in the center, the eastern part of the Chateau with its hipped gable roof and widow's walk has its dagged canvas awning partly retracted. A two story, cross gable roofed house is in the upper left. Further back near the center, the eastern wing of the pavilion has a sign that reads: Iron Springs Co. Office. In the background, the scrub dotted bluffs of Engleman Canyon meet the sky. 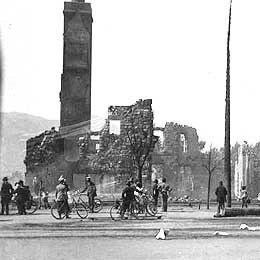 The Antlers Hotel after the fire of 1898. The Antlers Hotel is truly a "landmark of excellence" in Colorado Springs, as historical as the city itself. General William Jackson Palmer founded Colorado Springs in 1871 and, soon after, tourists and health-seekers alike made it one of the country's top resort destinations. 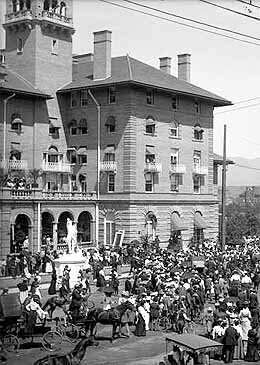 Palmer was at the forefront of plans to establish a luxury hotel for travelers who were discovering the Pikes Peak region. On June 1, 1883, the doors opened on the hotel which was to remain at the center of the community for the next 100 years and on into the second millennium. The name "The Antlers" was distinctly appropriate since the lobby was adorned with the General's numerous elk trophies. Modeled according to English architecture, the hotel was a Victorian mass of towers, turrets, balconies and porches. It featured 75 guestrooms, each completely unique in design. One of the most attractive aspects for that era's guests was the sanitary facilities -- two bathrooms on each floor. An English teacher from Wellesley College stayed at The Antlers in the summer of 1893 and gave the hotel its most significant, and certainly proudest, place in history. Katherine Lee Bates journeyed to the summit of Pikes Peak where the ". . .purple mountain majesties. . ." so inspired her creative spirit that, upon returning to her room at the Antlers, she penned the poem which was to become our country's beloved song, America the Beautiful. The popular Antlers Hotel was in its glory days when a fire started in the train depot and then spread, destroying the hotel and threatening the entire city. When the word of the October 1898, disaster was relayed to General Palmer who was in England, he promised to rebuild. By the time the new Antlers Hotel opened in July 1901, the burgeoning city was ready for its exquisite grandeur. Besides 230 lovely guestrooms ( which cost only $1.50 per night), a bowling alley, bicycle rooms, barbershop, a billiard room and Grand Ballroom attracted many people to the hotel. Although Colorado Springs residents raised a furor over demolishing their treasured landmark hotel, the second Antlers saw its last guest check out on September 20, 1964. When the new Antlers opened in March 1967. With 276 rooms, Antlers is Colorado Springs premier downtown hotel, major renovations completed in 1990. Waiting for Pres. Theodore Roosevelt at the rebuilt Antlers Hotel, 1901. America's conservation President set aside more than 230 million acres of land as 150 national forests, 51 federal bird reservations, 4 national game preserves, 5 national parks, 18 national monuments and 24 reclamation projects including Crater Lake National Park and 15 National Forests in Oregon. For more, read Theodore Roosevelt & the Siuslaw National Forest. Early in his career, Roosevelt organized the nation's first bike cops when he created the Scorcher Squad in the New York Police Department.